Independence Hall. This is a world heritage site and among the most famous on planet earth. It was here that the Declaration of Independence was signed by the Founding Fathers. The Constitution was also signed here. There is no fee for viewing the building. The tables and chairs are all set up in the position that historians believe they were originally left. Something important to remember is that although the tour is free, the tourist center only gives out a limited amount of tickets that are valid for entrance every day, so try and arrive early in the morning. The tickets are then valid until closing time. There is a lot of background history about the signing of both documents within the hall. It is the perfect place for a family to visit and appreciate together. National Constitution Center. This is the most interactive history museum in American and it is absolutely free! It is literally located just down the street from the Liberty Bell and Independence Hall. It is also the only museum in the country dedicated specifically to the Constitution and history of “we, the people.” There are wax figures, documents and in-depth explanations of the wonder that is the Constitution. The Spies, Traitors and Saboteurs may well be the most entertaining part of the museum, and it is sure to entertain children. Don’t miss out on this fantastic attraction. Liberty Bell Center. The Liberty Bell is well known for the small crack in its side. But it is better known for what it represents: liberty! The Liberty Bell Center is free. 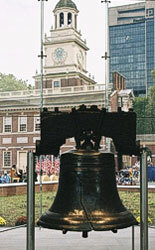 The bell itself originally hung in Independence Hall, which is located across the street. Its fracture was enlarged to increase its sound, but a larger crack soon brought the beloved bell into retirement. The bell is displayed in a glass case and can be viewed inside or outside the center at all hours of the day. Don’t forget your camera! City Hall. It may not be as old as Independence Hall or the Liberty Bell, but it is still a lovely architectural feat. It was built in 1901 and, for a small fee, you can join the walking tour that appreciates the interior design of the building. You can even climb the tower for a fantastic view of the entire city! The Constitutional Walking Tour of Philadelphia. It costs a little money, but it’s worth it. You are guided on a walking tour of the city, to more than twenty historic locations.